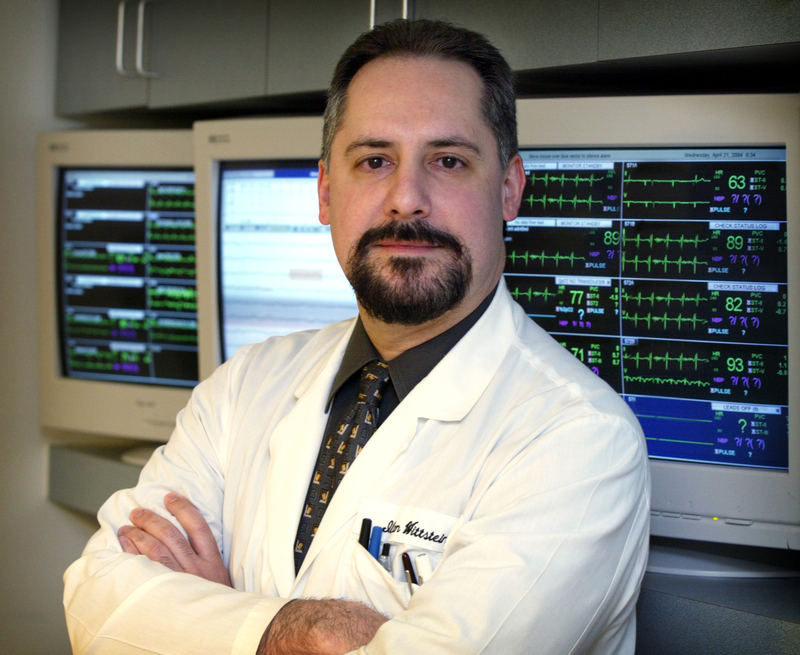 Hopkins cardiologist Ilan Wittstein, M.D. Shocking news, such as learning of the unexpected death of a loved one, has been known to cause catastrophic events, such as a heart attack. Now, researchers at Johns Hopkins have discovered that sudden emotional stress can also result in severe but reversible heart muscle weakness that mimics a classic heart attack. Patients with this condition, called stress cardiomyopathy but known colloquially as “broken heart” syndrome, are often misdiagnosed with a massive heart attack when, indeed, they have suffered from a days-long surge in adrenalin (epinephrine) and other stress hormones that temporarily “stun” the heart. In the Hopkins study, to be published in The New England Journal of Medicine online Feb. 10, the research team found that some people may respond to sudden, overwhelming emotional stress by releasing large amounts of catecholamines (notably adrenalin and noradrenalin, also called epinephrine and norepinephrine) into the blood stream, along with their breakdown products and small proteins produced by an excited nervous system. These chemicals can be temporarily toxic to the heart, effectively stunning the muscle and producing symptoms similar to a typical heart attack, including chest pain, fluid in the lungs, shortness of breath and heart failure. Upon closer examination, though, the researchers determined that cases of stress cardiomyopathy were clinically very different from a typical heart attack. For example, examination by angiogram showed no blockages in the arteries supplying the heart. Blood tests also failed to reveal some typical signs of a heart attack, such as highly elevated levels of cardiac enzymes that are released into the blood stream from damaged heart muscle. Magnetic resonance imaging (MRI) scans confirmed that none of the stressed patients had suffered irreversible muscle damage. Of greatest surprise, the team says, was that recovery rates were much faster than typically seen after a heart attack. Stressed patients showed dramatic improvement in their hearts’ ability to pump within a few days and had complete recovery within two weeks. In contrast, partial recovery after a heart attack can take weeks or months and, frequently, the heart muscle damage is permanent. The researchers collected detailed histories and conducted several tests, including blood work, echocardiograms, electrocardiograms, coronary angiograms, MRI scans and heart biopsies, on a total of 19 patients who came to Hopkins between November 1999 and September 2003. All had signs of an apparent heart attack immediately after some kind of sudden emotional stress, including news of a death, shock from a surprise party, fear of public speaking, armed robbery, a court appearance and a car accident. Eighteen of the stressed patients were female, between the age of 27 and 87, with a median age of 63. The results were then compared to seven other patients, all of whom had suffered classic, severe cases of heart attack, called a Killip class III myocardial infarction. When results from both groups were compared, the researchers found that initial levels of catecholamines in the stress cardiomyopathy patients were two to three times the levels among patients with classic heart attack, and seven to 34 times normal levels. Catecholamine metabolites, such as metanephrine and normetanephrine, were also massively elevated, as were other stress-related proteins, such as neuropeptide Y, brain natriuretic peptide and serotonin. These results provided added confirmation that the syndrome was stress induced. Heart biopsies also showed an injury pattern consistent with a high catecholamine state and not heart attack. A hallmark feature of the syndrome was the heart’s unique contraction pattern as viewed by echocardiogram, or ultrasound. While the base of the heart’s main pumping chamber, the left ventricle, contracted normally, there was weakened contraction in the middle and upper portions of the muscle. Other characteristics included a distinctive pattern on electrocardiogram, or EKG. The researchers also plan to study whether certain patients have a specific genetic vulnerability for developing stress cardiomyopathy, and why it predominantly strikes older women. While the folklore of “broken heart” syndrome has been around for decades, the prevalence of the condition remains unknown. According to Wittstein, some reports exist, mainly from Japan, and describe similar syndromes, but no biochemical analyses have previously been performed that link the condition to elevated catecholamine levels. The researchers contend that while stress cardiomyopathy is not as common as a typical heart attack, it likely occurs more frequently than doctors realize. They expect its numbers to increase as more physicians learn to recognize the syndrome’s unique clinical features. Funding for this study, conducted solely at Johns Hopkins, was provided by the Bernard A. and Rebecca S. Bernard Foundation. Other researchers who took part in this study were Trinity Bivalacqua, M.D., Ph.D.; Jeffrey Rade, M.D. ; Katherine Wu, M.D. ; Gary Gerstenblith, M.D. ; Steven Schulman, M.D. ; Kenneth Baughman, M.D. ; João Lima, M.D. ; and David Thiemann, M.D.